Indonesia is the world’s largest archipelago, straddling the equator with over 17,000 diverse, remote islands and 80,000 kilometers of unspoiled coastline to explore. 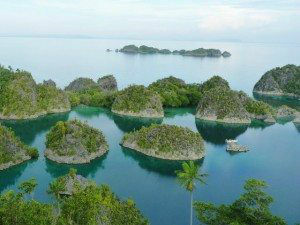 Its untamed natural beauty, year-round tropical climate, and unrivaled dive sites makes Indonesia a true paradise on Earth. Galapagos Yacht Charter Itinerary – NATURE! Experience Nature as you have never experienced before in the Galapagos and will never experience again in any other yacht charter location in the world. The Galapagos are very special. On this yacht charter itinerary, it is all about Nature up close, as is only possible in the Galapagos. With 7 large guest staterooms all with ensuite bath, Dunia Baru, just launched, is a great new luxury yacht charter addition for sailing vacations in Indonesia for up to 14 guests. Following along with the traditional sailing boat genre in Indonesia, this is a modern designed Phinisi, built by the Konjo Boat Builders from Sulawesi, an age old traditional boat building village in Indonesia. 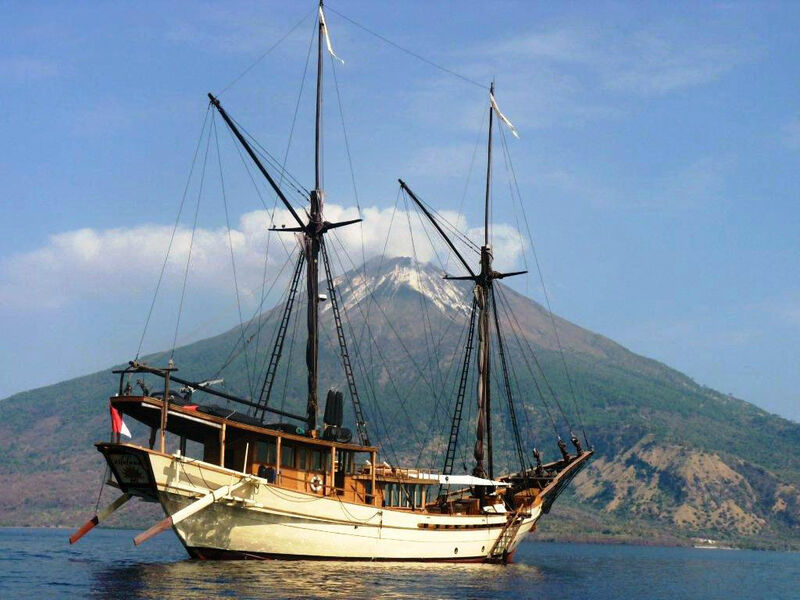 Dunia Baru means “New World”, as the Owner along with Kasten Marine spent many hours designing a “new world” Phinisi that has all of the modern amenities, yet is still reflective of Indonesian maritime history and culture. Chartering in the Komodo Archipelago, home of the Komodo Dragon and the Eastern Flores Archipelago, home of the Ikat Textile weaving villages in summer, and Raja Ampat, home of the Four Kingdoms, in the winter, Dunia Baru is a great new charter yacht addition for #yachtcharter, in Indonesia, which is a terrific new emerging luxury yacht charter location. Fly into Bali, for a yacht charter in the Komodo Archipelago, or Eastern Flories Archipelago in the summer, and into Sorong in West Papua for a charter cruising through Raja Ampat in the winter. A yacht charter in these magical location is different and so unique, as Indonesia is unlike any other yacht charter cruising destination. 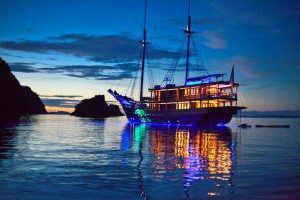 Experience a Sevusevu and ceremonial village Meke Dancing on a private yacht charter through the Out Islands of Fiji. While the two main islands of Fiji have been modernized, centuries old customs continue in the little villages on the hundreds of smaller islands, many of which can only be visited on a yacht charter. A strong societal hierarchy exists on the smaller outlying islands in the villages, most of which are guided by a Village Chieftain. When visiting the anchorages or harbors “owned” by the various villages in a crewed yacht charter, cultural politeness requires going ashore to ask the Village Chieftain, and other village elders, for permission to anchor and enjoy their waters through participation in a Sevusevu Ceremony around the Kava Bowl. If deemed to be an important guest, the Village Chieftain may organize the villagers for a Meke Dancing Ceremony. Or, in the case of Malakati Village in the Fijian Mamanuca Islands, for a small fee, the Captain of your crewed charter yacht can arrange to have the villagers perform the Meke Dancing Ceremony as if you were the most important guests ever received in their small village. Northrop-Johnson Yacht Charters, when visiting on a crewed charter yacht, participated in a ceremonial Sevusevu around the Kava Bowl, and this Meke Dancing Ceremony in Malakati Village led by village elder, Joe. Gwyneth Paltrow was recently on board one of our most favorite yacht charter choices, Silolona Sojourns charter yachts, where she and her famiy cruised in the Komodo Archipelago in Indonesia. In her blog Paltrow raves about the yacht charter experience. The Silolona charter yachts are comprised of the 164’ charter yacht Silolona and the 131’ charter yacht Si Datu Bua available for yacht charter in Indonesia and Myanmar. 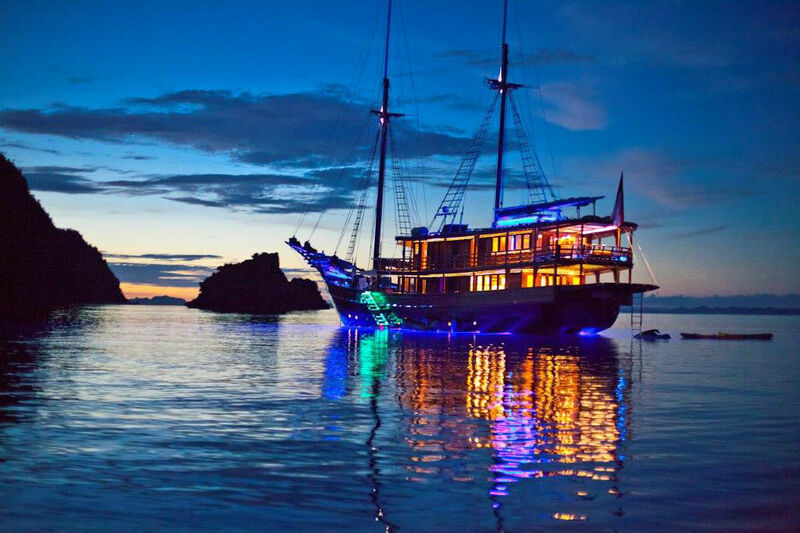 A yacht charter on board Silolona or Si Datu Bua is not only a great yacht charter experience, with every mega yacht amenity but is also a terrific glimpse into local life and culture in Indonesia or Myanmar. 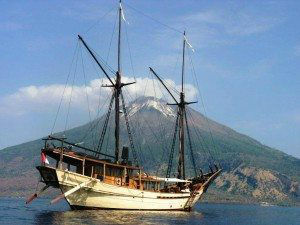 Yacht Charter in Indonesia is a terrific experience on the private charter yacht Silolona, a 164′ Phinisi Sailing Yacht. Silolona offers outstanding yacht charters in two unique emerging yacht charter locations in Indonesia: the Komodo Archipelago and the Eastern Flores Archipelago on the western and eastern ends of Flores Island in the summer and in the winter in Raja Ampat, home of the Four Kingdoms. A traditional appearing Phinisi on the exterior, on the interior Silolona offers top luxury accommodations in 5 guest staterooms each with ensuite bath. The crew offer 5 star service in 5 star cruising locations. In the Komodo Archipelago see the famous Komodo Dragon in its natural and only worldwide known habitat in the National Park on Komodo Island. in the Eastern Flores Archipelago, anchor in the shadow of puffing volcanoes, visit traditional Ikat Textile weaving villages, participate in traditional dancing ceremonies, snorkel or dive over beautiful coral gardens, and enjoy endless pristine beaches great for shelling. In Raja Ampat, sail between the Four Kingdoms, cross the equator, snorkel in caves, sea kayak past wild orchids clinging to the rocks, and see fabulous underworld life and outstanding coral gardens, This is truly a unique and outstanding yacht charter experience in luxury and comfort, cruising in either area on a yacht charter in Indonesia. For more information contact Northrop and Johnson Yacht Charters. 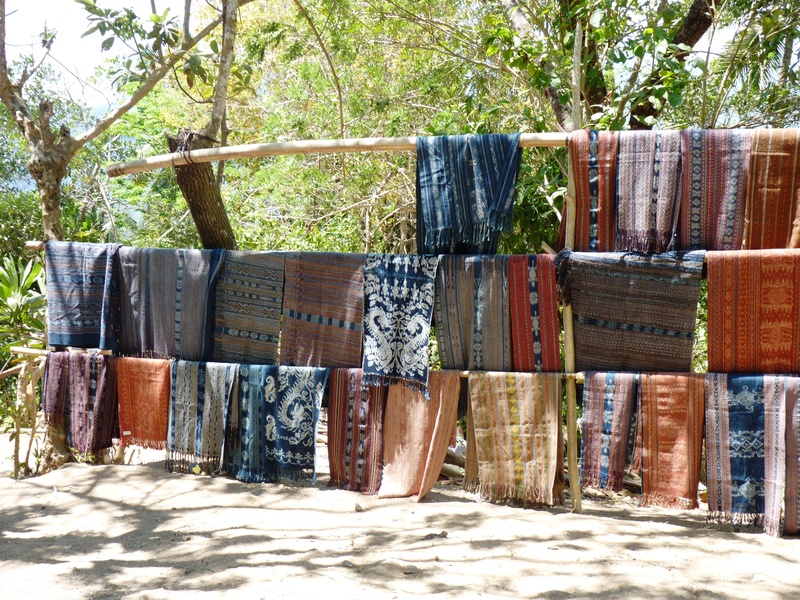 Peppered around the Flores Archipelago in Indonesia are a number of Ikat Textile Weaving Villages where Textile weaving is part of everyday village life. 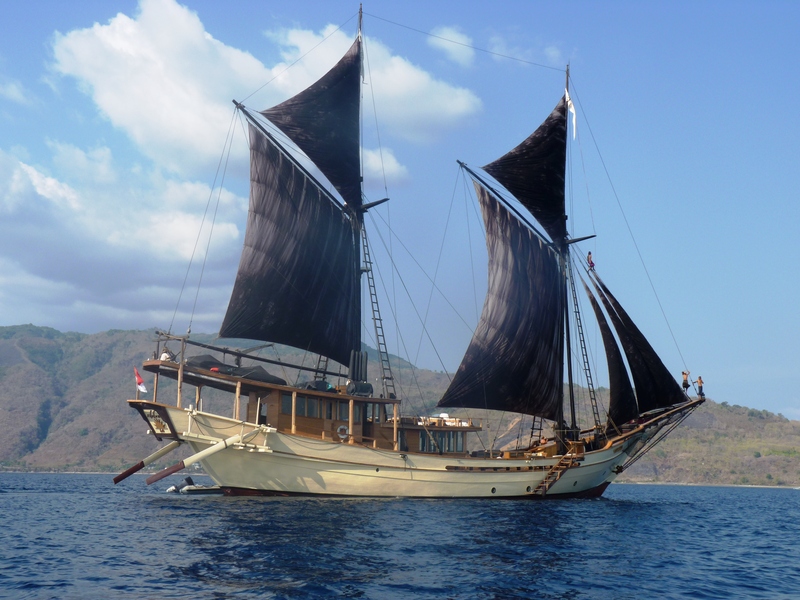 Visiting these various villages, mainly located in Volcano Alley in the Eastern Flores Archipelago is most easily done by crewed yacht charter. These are villages at the base of volcanoes on islands where every day life is as it has been for centuries. 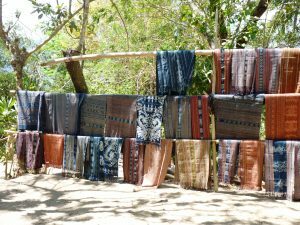 This is where true Ikat Textiles are woven and created using natural dyes hand made, with cotton carded and spun into threads. Where bits of naturally occurring sisal arewoven around the cotton threads for resist dying. Looms are hand made from branches. Without regular ferry systems, these villages are best visited by private yacht charter to truly see and experience tradtional daily live in the villages. 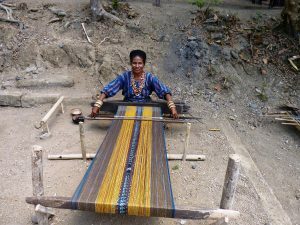 Visit Watublapi Village, a Weaving Village on crewed yacht charter in the Flores Archipelago in Indonesia to see firsthand a fabulous demonstration of Ikat Textile weaving by the villagers of Watublapi, wearing their village Ikat designs captured here in this pictorial review. This is an extraordinary chance to see an age old weaving tradition, done by hand on hand made looms, in villages rarely visited except by crewed charter yachts. Boarding the 164’ sailing Phinisi charter yacht Silolona is a warm welcoming experience for a start to every on board yacht charter cruise. Step on board and be greeted with a cooling lemon grass scented wash cloth to wash away the travel heat and be refreshed with a tall cool glass of fresh fruit juice, while you settle in on deck for a welcome from your crew. On your arrival for your yacht charter cruise all of the crew gather on deck to be introduced to you to start your yacht charter cruise with traditional Indonesian music and songs, for a great kick off for a terrific yacht charter experience on board the sailing Phinisi charter yacht Silolona. 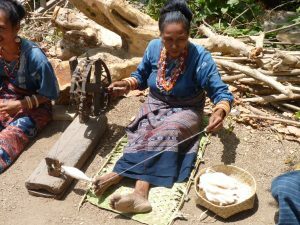 Visiting the textile villages of Eastern Flores Indonesia is really best done by crewed yacht charter, as there is only a small local ferry system in this area visiting just a few ports. The crewed sailing yacht Silolona is available for crewed yacht charter in Eastern Indonesia and in our opinion, here at Northrop and Johnson Yacht Charters, sailing on the crewed charter yacht Silolona is the best and possibly only way to visit the various local Ikat Textile weaving villages in the Eastern Flores Archipelago, where the women are still very much involved in traditional Ikat Textile weaving by hand as a part of their daily lives. When cruising through the area on the crewed sailing charter yacht Silolona, a number of villages can be visited that are clustered on the various islands where dyeing, spinning, and weaving cotton fibers is still done with dyes made from natural ingredients, with cotton spun by hand, to create textiles woven by hand on hand made looms. The dyeing however is an exceptional traditional village industry with dye recipes handed down from mother to daughter to create the many colors of the fabric of life in this area of Indonesia. 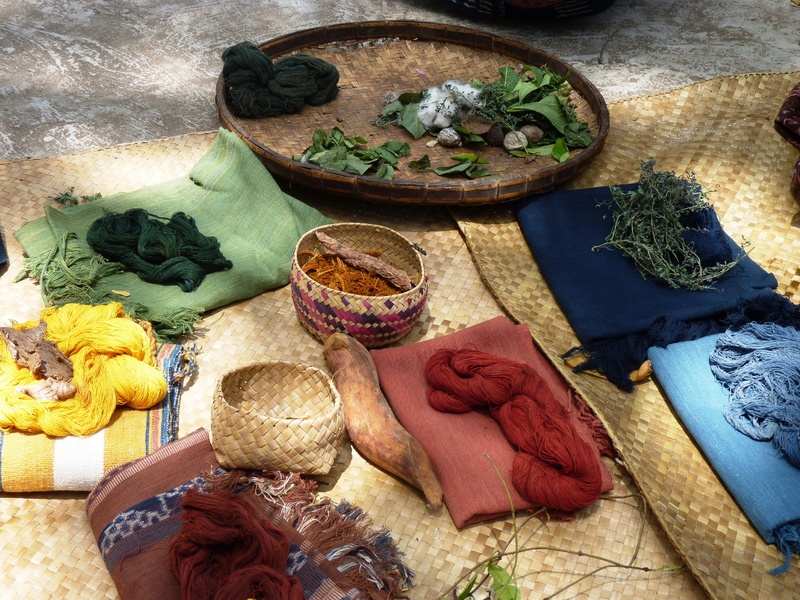 We were thrilled when visiting several villages in Eastern Indonesia in the Eastern Flores Archipelago while cruising on board the 164’ crewed charter sailing yacht Silolona to see, first hand, the making of natural dyes and the dyeing process used to color these hand spun cotton strands. We learned that all of the dyes are generally now and always have been made from ingredients found in the surrounding landscape, as the only resource available to these village people for the last number of centuries and still today. 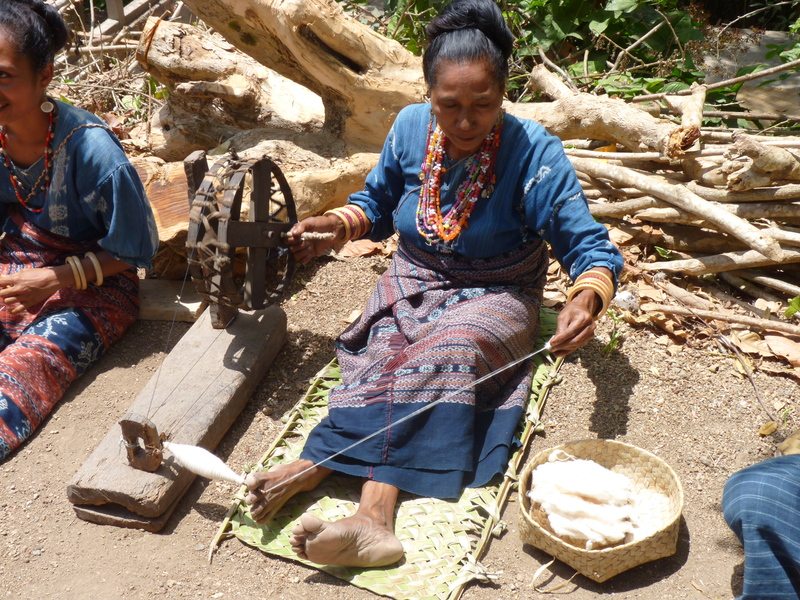 Many of the women in the villages in Indonesia in the Eastern Flores and Alor Island areas are still making various dyes to dye strands of cotton as they have been for centuries. Cotton is grown and harvested in Indonesia and the women in the villages work the cotton bolls, so that the cotton bolls are seeded, carded and spun by hand into cotton strands for weaving. Either the strands are dyed various colors first or are tied with dye resistant natural fibers such as raffia to create Ikat patterns in the cotton strands, to then be dyed. The predominant color used for the natural dyes is blue with various shades of blue created from the locally grown indigo plant. Natural indigo dye for the various shades of blue is created by a fermentation process over low heat, usually in a pot over a small wood fire. The indigo plant is mixed with natural madder from the roots of a low growing ground vine, grains, and soda ash, made from the ash of leaves. By slowly cooking all together in a pot on low heat while gently stirring, a sludge of oxidized indigo is created on the bottom of the pot, which is strained and used or dried and stored as dye cakes to be used at a later time. When dyeing, the indigo blue color is adhered to the cotton strands by drying the strands each time after repeated dipping to allow the color to oxidize in the air for permanent color affixation. The color red is created by crushing the bark of the Marinda tree in water to extract a red pigment called morindan. Unlike indigo blue, which is a fermentation process, dying red requires a mordant to be combined with the morindan to affix the color to the strands of cotton. A mordant requires oil, tannin and aluminum salts and in Indonesia is often created with an oily solution made out of the candle nut, a tannin made from local plants, and aluminum salts made from the powdered leaves and bark of certain trees that grow in Indonesia at a very high level. For use in the lowland villages, the powdered leaves and bark of these highland growing trees must be acquired in trade. 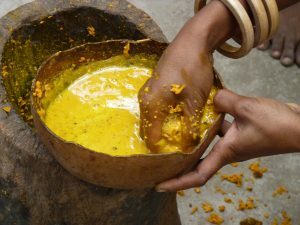 Yellow dye can be created by pounding the turmeric root with water in a mortar with the end of a small tree trunk or pestle. 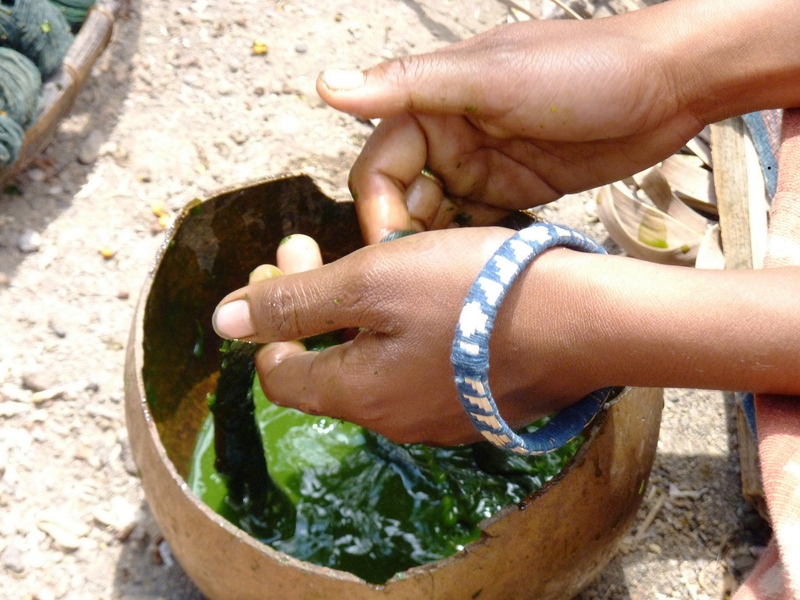 Green dye can be created by pounding leaves with water in a mortar for a fresh green color created from the chlorophyll. Neither of these dyes produces a color that is steadfast and both the yellow and green cotton strands dyed from dyes made in this manner will fade in a short matter of time. To create a more permanent yellow dye, the bark from the mango tree, jack fruit tree and heartwood tree are pounded to create a more durable yellow color. This dye can then be mixed with an indigo blue for a more permanent green color. Whatever the method the women in a particular village choose to use, this fascinating and still traditional industry of cotton dyeing can be seen firsthand in various villages on a yacht charter on the crewed sailing yacht Silolona on a charter in the Eastern Flores Archipelago in Indonesia while visiting the Ikat Textile weaving villages. The 164’ Phinisi crewed charter sailing yacht Silolona is wrapped in legend and shrouded in mystique, which adds to the magic of a charter experience on board. For, just as the in the legend of Silolona, for whom the yacht is named, when starting a charter on this yacht, a call is made to Silolona to add her strength to a successful on board charter experience.